The Opencast community is an international collaboration of individuals, higher education institutions and organizations working together to develop, define and document best practices for the management of audiovisual content in academia. The annual Opencast Community Summit was hosted on 1–3 March, 2017 at Universitat Politècnica de València. Around 80 participants attended this year’s Opencast Summit 2017 from universities and organizations all over the world (including the universities of Harvard, Michigan, Manchester, Keele, Cape Town, Graz Tech, Helsinki, Köln, Münster, KU Leuven, UPV…) to share expertise and experience across the field of academic video and explore opportunities to collaborate in related projects. The MLLP participated in Opencast 2017 with a presentation on their recent work and experience with massive multilingual subtitling of video repositories, and on the new official UPV poliTrans service. The MLLP, in collaboration with the UPV Media Services, has developed the UPV’s own multilingual automatic transcription and subtitling service, poliTrans, with which the university is maintaining subtitles for all of the videos in its institutional video repository, poliMedia (in several languages: English, Spanish, Catalan, French…). 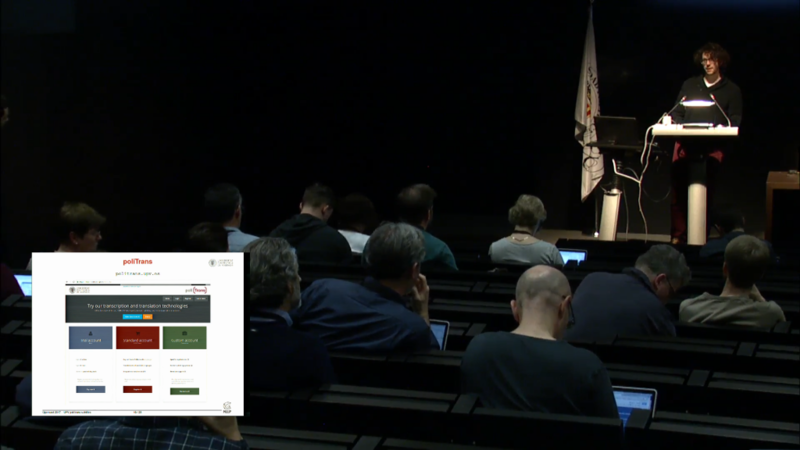 In this talk, the MLLP’s Gonçal Garcés Díaz-Munío showed the work the UPV has been doing to apply this technology to the university’s Opencast video repository, Videoapunts. You can watch here the recording of the MLLP’s presentation, “Automatic multilingual transcription and subtitling with Universitat Politècnica de València’s poliTrans”. Additionally, you can watch all other presentations from Opencast 2017 on their website (have a look at the Opencast 2017 programme first if you want more details and the abstracts of the presentations). We encourage any person or organization interested in subtitling their own videos and recordings to try the poliTrans service. Just register in the poliTrans website and start uploading your videos! The Opencast Summit 2017 was an excellent occasion to share experiences on innovation in the production, use and management of learning contents. We look forward to future editions of the summit. The MLLP presentation at Opencast 2017: “Automatic multilingual transcription and subtitling with Universitat Politècnica de València’s poliTrans”. Watch here the presentation’s recording. Posted in All, Events, Videos and tagged Automatic transcription and translation, Educational Technologies, Opencast, Opencast Community Summit 2017, poliTrans.